I think we can all agree that going back to school is expensive. However, it doesn't have to break the bank. :) Today I'm excited to share some tips and tricks that have saved me money over the years during the back to school season. Hopefully you might find a tip or trick that will help you out this year too! The biggest thing that has kept my BTS shopping from breaking the bank is setting a budget each year. I either withdraw that money from the bank and use that cash to do my BTS shopping OR I put the money on a prepaid Visa/MasterCard. I get a prepaid card when I plan on doing a lot of online shopping. Occasionally, I'll go over but I really try not to. My husband is so supportive of my teaching adventures and I feel my BTS budget is generous enough to begin with. glue sticks, and scissors at amazing prices. However, I started saving a lot more money when I started buying only what I needed. I don't do a lot of art projects or interactive notebooks, so there is really no reason for me to buy 50 pairs of scissors and hundreds of glue sticks. Typically, I buy some extra highlighters and crayons for my students to use during my guided reading groups, extra pencils, and extra dry erase markers. I also buy an additional notebook for each of my students because I like to use two notebooks, one for reading and one for writing, and our district supply list only asks for one. That might sound like a lot but since I'm only buying extras of a few things, I don't spend nearly as much as I did when I bought extras of everything on our supply list. This tip is simple, but SO true. Shop your classroom first. I don't know how many times I've gone to the teacher store for something in August, only to find out that I had what I just bought in my classroom. We also have a donation spot at my school and sometimes I have found what I needed there for free! If you are in search of bigger things, like filing cabinets or furniture, send an email out to your district. Someone at another school just might want to get rid of theirs. When you head out to do your shopping, go with a list or purpose in mind. I don't know how many times I've picked up a notebook or notepad just because it was cute and then never used it. The other day I went shopping for book bins at Target and that's all I bought. Even though I wanted some new Mr. Sketch markers and some Flair pens too. I know I spend a lot more money when I just wonder around the store with no purpose in mind. I saved a lot of money the other day when I bought bins for my library because Target had a Cartwheel coupon for them. I buy ink and laminating pouches on Amazon because they are so much cheaper online. My local teacher store also has a special day when teachers get discounts on their purchases. I saw that Big Lots will be doing an educator discount day and Walmart has their teacher rebate this summer. When I go to buy an extra notebook for each of my students, I search the sale ads to see who has them the cheapest and that's where I buy them. :) Anytime I buy something from Hobby Lobby or Michaels, I always check my phone for coupons. I actually found a great deal on my new library book bins at Home Depot of all places because I searched and searched online for the best deal. The classroom of your dreams, especially if you are a new teacher, isn't built overnight. It's okay to add things to your classroom as the year goes on and you have the extra funds. Or if you like having 50 extra pairs of scissors, a 100 extra glue sticks, and 25 extra boxes of crayons to use throughout the year, wait until a few weeks after school starts. I know Target usually has an AWESOME clearance section after school starts. I've purchased class sets of notebooks for pennies after school starts and I just save them for the next year. Craiglist, thrift stores, and garage sales are a great way to get things for your classroom for a great price! I've also scored several wonderful books on clearance this summer at Half Price Books. Our local children's resale shop offers teachers a discount when they purchase books and furniture for their classroom. Most of my classroom library is from Goodwill. I've also found used copies of resource/professional books in great condition for a great price online! My last tip is perhaps the hardest. Stop comparing your classroom to others because it's not fair. Focus only on the special environment you have created within the four walls of your classroom. It's okay if you don't have trendy chevron borders, a ton of Pinterest inspired projects, fadeless bulletin board paper, etc. While I have the classroom of my dreams right now, I waited seven years for it. I inherited every thing I needed for a stars and stripes classroom when I first started teaching. So that's what I did. All my posters were handmade and I didn't care one bit. As time went by, I added things here and there to make the room feel more me, even if it wasn't the classroom theme I would have chosen for myself. I rocked that stars and stripes theme for four years. Then I used all my blue and red bins and borders to do a primary polka theme before I finally invested last summer in my black and neon bright classroom. What about you? 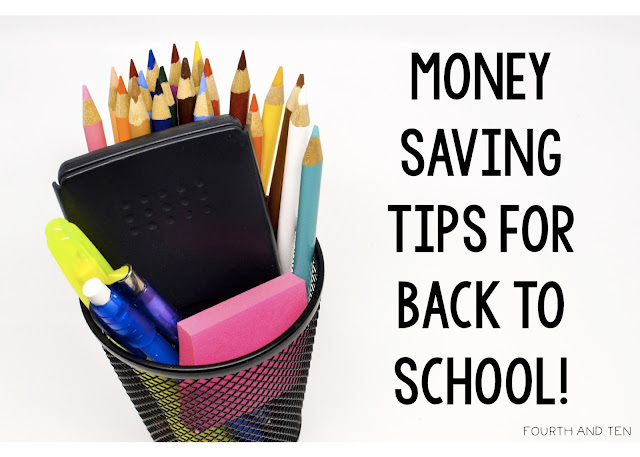 How do you try to save money when it comes to Back to School? Such great tips! I try to buy what I need to get started and I always hit the Target after school clearance. This year, I have 30 poly homework folders to pass out to my students that I scored for about .08 cents last year instead of the .50 something. It really does pay to only get what you need and always look around your room first. I always find extra supplies that I forgot about. This year, I didn't need to buy any new post-its (except for my .02 cent Target score) because I saved so many last year. I'm definitely going with the prepaid Visa next year. Love that tip. I do set a budget but then I'm bad about finding something "cool" while I'm out shopping for something else. When I am shopping though, I do always have my list and budget in mind. These are great tips. I feel like with IG it's so easy to get carried away seeing everyone's cute pictures and things like that. I did a much better job this summer than last summer. I spent way less, and I love the shift in me that is caring more about getting great books rather than decor. Isn't that what it's all about? Apple is getting ready for the iOS update for developers. If you are interested in downloading/installing iOS 12 beta on iPhone or iPad device. It is now time to prepare for the rollout of iOS 12 update for your devices.